Wow! We actually have an episode where Miki isn’t bullied! But just because she isn’t being sabotaged and blatantly misunderstood by her coworkers doesn’t mean things are looking up for Miki quite yet. This episode does focus more on Nakahara and Tachibana than on Miki in the beginning. We pick up with Nakahara telling Miki that they can’t be together and that he needs to talk to her in person to tell her something. Miki goes to the office the next day and does her best to perk herself up to start the day of work. She comes into the office and says good morning and at least no one starts immediately complaining about her. Kurano comes out and gives her materials and tells her to prepare for a presentation on the new tomatoes. This annoys Nishijima, but what doesn’t? Miki is shocked to be handed the work, but does her best to get everything ready. When she gets back to the office, she learns of Tachibana’s impending wedding to Nakahara as Tachibana’s coworkers are all congratulating her. Tachibana pulls Miki aside and says that she is pregnant and has chosen to raise the baby by herself (so why does everyone think she’s marrying Nakahara?). Oh, and Tachibana reveals to Miki Nakahara’s involvement in the whole Bando scandal. Miki knew something was amiss with Nakahara, but he never confided in her. Although, he never confided in Mariko either. She just knew because of Tazawa’s spy cams. Nakahara is about to go to a meeting when he is pulled aside to meet the head of some iron company who expressly asked for Nakahara by name. And wouldn’t you know the man is none other than Tachibana’s father! He invites a stunned Nakahara over for the weekend to talk about the problem at hand before getting down to business. Don’t kids usually not want to tell their parents right away about such pregnancies? You definitely know that Tachibana is doing what ever she can to keep her claws in Nakahara. The girl just won’t play fair. That night Nakahara waits for Miki who goes to ignore him, but he won’t let her. She tells him that she heard everything from Tachibana and that what she said on the phone stands. Nakahara goes to stop her and tell her that no matter what happens between him and Tachibana, he will always love her. Miki stops him before he can finish the sentence and tells him that he is being selfish. He needs to think about both her and Tachibana’s feelings. To say such things to Miki is unfair to her and to the woman who is carrying Nakahara’s child. Nakahara meets with Tachibana who says that a coworker overheard their conversation the other day and by that day the rumor had spread that they were getting married. Nakahara says that he met with her father and wants to scold her about telling him, but Tachibana says that she is sorry, that he must be just as confused as she is. Yeah, right. We all know that Tachibana is a vicious little schemer who isn’t confused about anything she is doing. She told her father to do her best to trap Nakahara. Kurano and Miki do the presentation, but when push comes to shove, Miki just can’t perform so Kurano has to step in and give it. Knowing how thoroughly Miki researched and was able to talk about the expensive olive oil in a previous episode, makes you wonder why she wasn’t quite so prepared this time. Was it because of the news about Tachibana and Nakahara? 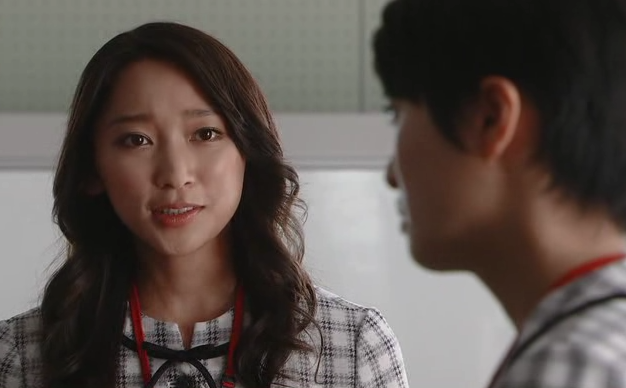 Miki goes back to the office where Nishijima asks her how it went. The crestfallen Miki admits that she couldn’t give the presentation which Nishijima says that was a given. Kurano comes back and Miki goes into his office to apologize where she receives a scolding for being half baked which makes things worse for everyone. Miki did deserve that scolding as she did not do her job properly after given the chance. As good as she is, she needs to learn to divorce personal issues from interfering with work performance. The weekend comes and Nakahara meets with Tachibana’s parents. Both assume that they will be getting married. Nakahara was going to interupt and say that they haven’t really worked anything out yet, but Tachibana jumps right in and says she plans on raising the baby alone which angers her father who starts slapping, yes slapping, Nakahara. 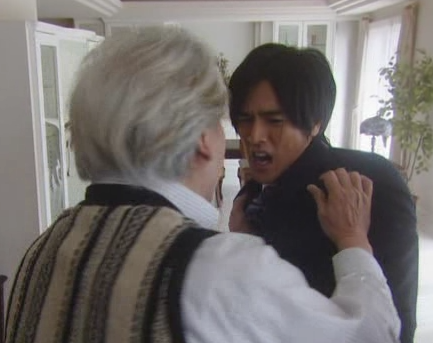 Tachibana tries to stop him and gets shoved roughly to the ground. Hello! Supposedly pregnant woman! Out of curiosity, would a pregnant woman protect the man she loves, or their unborn child first? Tachibana’s mother takes care of his bleeding lip and says that they want the best for their daughter so that’s why this situation is hard and comes as such a shock. When Tachibana and Nakahara leave, Tachibana says that she will turn against her parents for him as she said she will always support him and be by his side. Blech. And you know her words do have an effect on Nakahara. Even though he loves Miki, she is making him think of Tachibana and all of the things that she has done for him thus far. While that was going on, Miki tells Ai that she broke up with Nakahara because she could only see herself and couldn’t see the situation Nakahara was in at all. True, but she shouldn’t beat herself up too much as Nakahara kept everything to himself even when she asked. Nakahara tells his mom the news and you know that she is less than thrilled about it. Tachibana comes over with food and says that she is not a victim and she just could not let go of Nakahara so she has no regrets. When Tachibana leaves, his mom asks what she meant. Nakahara doesn’t tell his mother all of what happened, just that he leaned on Tachibana during a really difficult time for himself. His mother seems to be impressed by her strength. I guess she thinks that Tachibana is a better match than Miki because she seems to put Nakahara first, which, ironically, isn’t true at all. Tachibana only puts herself first. At work, Tazawa approaches Tachibana when she is all alone and asks if her pregnancy is a lie. It is nice to see that our creepy Tazawa isn’t cowed by Tachibana and is still intent on playing with her. Although, I still wonder if he has any motives at all, or if he just likes playing with people and observing what happens. I did think that from the beginning, he might like Miki. Not necessarily romantically, but just kind of like her as he seemed the most interested, but as the episodes go on, he is really hard to figure out. Thinking back on what Tachibana has done for him and what happened with her parents, Nakahara decides to do the right thing and marry her. He invites her to move in with him and she cries and tells him the pregnancy was a false alarm. Did Tazawa mentioning that scare her into telling the truth? 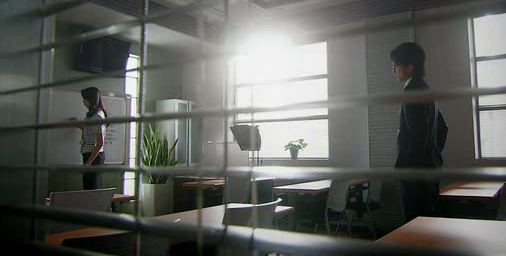 Miki goes into the office and it is just her and Tazawa at first. She sits down and he turns on the monitor cam so he can see her and tells her that Tachibana isn’t pregnant. Miki sits stunned for a moment and runs to find Nakahara. She asks about Mariko and he tells her the pregnancy was just a false alarm, however, he will stay with her now. After all she’s done for him, he wants to support her and protect her strength. Poor Miki. I think she was hoping to have a second chance since Tachibana turned out not to be pregnant. She walks away and starts running again and runs right into Kurano. She apologizes and he sees that she is crying. He asks what is wrong, but Miki doesn’t say anything and takes her leave. I don’t quite have Kurano’s feelings pegged yet either. He is a little on the old side for Miki (by 10 years give or take), but since when does age matter? I don’t know if he is starting to develop romantic feelings for her, or if he just wants to care for her because she reminds him so much of himself. Miki is working late at the office and staring at the postcard she received from Nakahara on their first date. Kurano comes in and Miki quickly hides the postcard. He gives her a slip of paper and tells her to be at the address at 10 the next morning. He has already cleared it with Sano. Miki goes and you can tell she doesn’t really know if she’s in the right place. Kurano calls out to her and she runs over to meet him. He has brought her to the greenhouses where they produce their special tomatoes. They meet with the owner who is pleased by the packaging that Kurano shows him for the new product. Miki and Kurano then go into the greenhouse. Miki is surprised by how dry the soil is and Kurano tells her that its because they are forcing the tomatoes to produce using minimal water to make the best possible tomatoes. Kurano then says that people are like tomatoes, despite everything their will be some bad ones, but the ones that can thrive and succeed in such an environment are the best. This really touches Miki and makes her think, which is exactly what Kurano wanted. The next day Miki is back working. She knocks over a stack of folders on her desk and the more mellow Sano comes and actually helps her pick them up. It is nice to see Sano not so tightly wound as she was in the very beginning. She is watching over and liking Miki more and more. You can also see that Chiaki is conflicted. She wants to support and befriend Miki again, but just can’t seem to bring herself to do so yet. Everyone else goes to lunch and Miki stares intently at a document, noticing something is off. She approaches Sano and tells her about it and Sano says that she will look into it right away without yelling or scolding or saying it is Miki’s fault. It’s nice. Kurita goes out on a company business and gets a call from the daycare saying he son is ill. Kurita is too far away and can’t leave the meeting, so she calls the office only to get in touch with Miki who immediately offers her help if she needs it. Kurita asks her to pick up her son and Miki readily agrees. She picks up little Kurita without a hitch and goes to wait in the park nearby Kurita’s house for Kurita to come. However, the little boy has to use the restroom and there is none in the park, so they use his house key to get inside. While he runs to the bathroom, Miki turns on the lights and discovers broken furniture, cracked glass, and what looks like punch marks cracking the plaster of the walls. The little boy finishes and runs out to Miki just as his father comes home. He quickly hides behind Miki and Mr. Kurita asks who she is. Miki introduces herself just as Kurita walks in. Her husband immediately tells her to quit if she can’t manage to do both work and everything else that needs to be done. Kurita puts her son in his room and tries to talk to her husband who roughly grabs her. Miki tries to intervene but is shoved to the ground. Sano, meanwhile, is going over the discrepancies when Kurano comes in. She tells him that he was right. At first she didn’t think Miki could do anything, but then that girl keeps surprising her. Miki managed to find a problem that had slipped Sano’s mind (their was a grape crop problem in 2006 when Sano apparently took over her current position). Sano then takes her findings to Umezawa and requests an investigation. Umezawa says that he will take care of it. When Sano goes to protest, her roughly grabs her wrist and pulls her down onto the chair next to him and says through gritted teeth that he will take care of it because she is obviously too busy. Something isn’t right there. The next day Miki comes into work and is worried when she sees Kurita enter. Nishijima asks what happened to Kurita’s arm (she has an enormous bruise). Kurita says she fell and Nishijima asks again and then calls her clumsy. Typical excuse for the battered and it is sad how many people buy it, or do nothing. Kurita then pulls Miki aside and they talk. Kurita shows Miki a divorce decree that she keeps with her at all times. Why hasn’t she filed it yet? Apparently she can still bare with it for now, but when she can’t anymore, she has it ready to file. Kurita then tells Miki that she thinks Miki will find a time when she can honestly say that she enjoys working at AOI. Looks like Miki has won over another coworker! Miki goes up to the roof and finally tears up Nakahara’s postcard and lets if be blown out of her hands by the wind. She vows to become stronger and find herself so no matter what happens, no matter who or what she loses, she will be okay. I am not sure, but then it looks like we fastforward to 2011 and Nakahara and Tachibana’s wedding. Umezawa approaches Shiraishi and asks to talk about Sano. Sano and Miki’s coworkers all arrive and they notices Umezawa and Shiraishi sitting pretty close together discussing something. Miki then shows up and the wedding proceeds without a hitch. Afterward, Miki is sitting by herself outside the hall. Kurano comes out for a smoke and he notices Miki. Before he can do anything Nakahara comes out. Miki goes up to him and says that she can’t congratulate him from the bottom of her heart because she doesn’t honestly feel that way. But she tells him he needs to be happy. Nakahara is happy to have Miki say at least that much to him. His mother tells him that Tachibana is looking for him and he takes his leave. Kurano turns to go, but Miki sees him and runs after him. She tells him that she will work hard to find out who she is and will do her best. She then deeply bows and asks for his help – to please give her some work. Let’s hope this new attitude lasts longer than all of her other “I will work harder” moments. I know. I took a sneak peek at the special and am not sure if we really end up with a stronger Miki or what. It will be a big let down if we don’t. It is horrible how it crossed into the typical soap opera mode. It always annoyed me when best friends or siblings pull something like that just to land the guy.